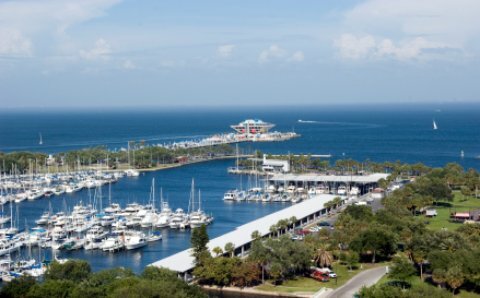 St Pete Beach: This classically beautiful beach is in a highly developed area with high-rise hotels, restaurants and shops. Laze on the beach or shop ‘til you drop or both. There is great food nearby and abundant nightlife. You have hit the vacation jackpot! Therefore, you have won the lottery or you are on St Pete Beach! The first time my two-year old saw this 35-mile long stretch of pure white sand he looked from left to right and asked if this was Marshmallow Fluff. (He had watched me make a dessert to bring to the beach.) Huh? Think melted marshmallows in a jar. Even the locals tell me they pretend to be tourists and come here to break the monotony of their day-to-day lives and enjoy a great beach and touristy area. Catch an inexpensive movie or Indy film in the charming St. Pete Beach Theater. Travel a little further down the beach to the popular Pass-a-Grille Beach Florida which is located in a small, historical area with cozy and welcoming restaurants and shops. Visit the Gulf Beaches Historical Museum for a lesson on the historical Madeira Beacbeauty of this and several other Florida Gulf Coast beaches. Don’t miss ‘The Quarter’ which is the area of old Petersburg considered the heart and soul. Numerous art galleries and antique stores abound, including the Salvador Dali Museum. Kids of most ages: Your trip would not be complete without a visit to Larry’s Old Fashioned Ice Cream Parlor where you and the kids can experience more ice cream choices than you’ve ever seen in one place. It's worth the short wait in line because, as you know, when you are on vacation, calories don't count! Eating: Snapper’s Sea Grill is a popular choice of many locals and tourists alike. Go there for great food and great service. For an affordable choice with great seafood and American dishes that has that classic “pub” feel, check out the creatively named Sloppy Pelican. Sleeping: Tradewinds Island Grand Resort is a classy resort-style hotel that is great for families with kids because of all of the children-oriented games and activities they offer. While the parents relax, the kids can play… and mom and dad can get a little break! For a small but very cozy and comfortable choice, stay in the Beach Haven Hotel. There is something for everyone at famous St John's Pass and Village, even though you probably won't want yours, you should see it anyway so be brave, access it here and have fun at Madeira Beach Florida.